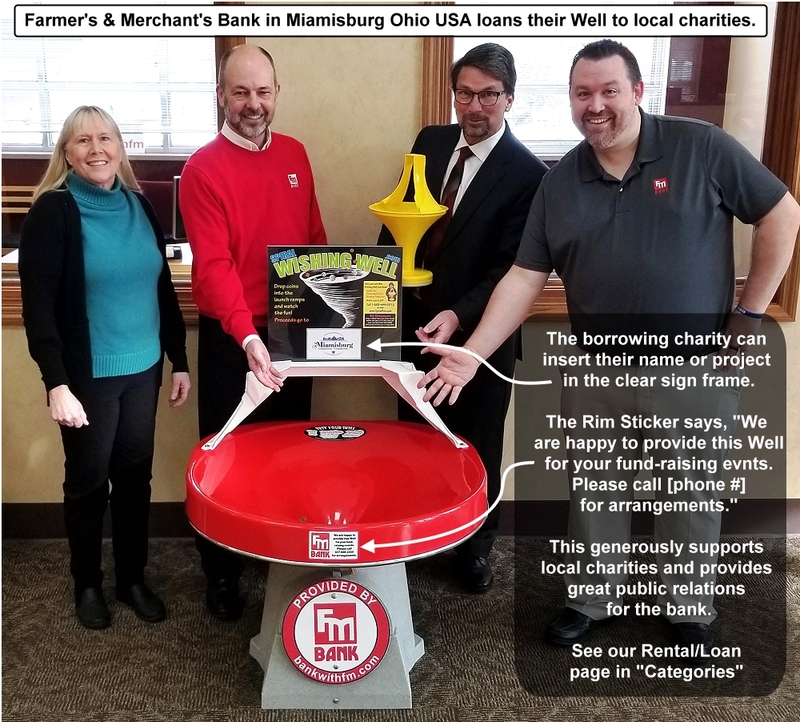 Many stores, restaurants, theaters, bowling centers, skating rinks, banks and credit unions, hardware stores, clothing stores, toy stores, and all other businesses with walk-in floor space use Spiral Wishing Wells to raise money for their preferred charities. Even doctor and dentist waiting rooms have Wells. If you own or manage a business, you probably already have a preferred charity that you support. A Spiral Wishing Well is an ideal way to raise money without the feeling of "soliciting" your customers. They will toss in coins with a smile on their faces! "We used to collect about $30 to $50 per month with the official collection canister. Since placing a Wishing Well, we've collected $300 to $500 each month." Easy and Simple: It is normally a lot of work for businesses to organize their employees for fund raising events. Wishing Wells replace that hassle with the easiest fund raising can be. Just place your Well in your traffic pattern, and the money pours in. "For the last eleven years, out of 8,000 Seven-Eleven Stores, I have been in the top five raising money for the Jerry Lewis Telethon. My Spiral Wishing Well is my number one fund raiser . . . at over $16 per day, almost $500 per month. We average about 2,000 customers a day and most of them come in regularly. Interestingly, those same people toss coins in day after day---even if it's only a few cents change from a cup of coffee, sometimes right down the middle of the funnel and they don't even watch it spiral. They just do it out of habit." Does not solicit: One of the great features of Spiral Wishing Wells is that it does not solicit your customers. People don't feel badly if they walk past without tossing money in. When solicitors meet your customers at the front door, there is a sense of pressure to donate. That is not conducive to shopping. Wishing Wells don't solicit. "We had such success with our first wishing well, we purchased additional wishing wells for our other stores. We pick a different organization to fundraise for in the stores and hear such positive feedback from our customers - the kids just love them, and they don't solicit our customers like a live person does! It is not only great exposure for the organization but is a reminder to our customers that we are a community minded company." Whether yours is a small single store, or a large chain, Spiral Wishing Wells can solve the challenge of raising money for you. It is a one-time purchase for unlimited years of service. They never get tired. They don't wear out. They're fun. They don't solicit your customers. They are win-win-win! You win, customers win, and your favorite charities win. "We purchased our Well in 1990. We have been the #1 contributing Dairy Queen Store in Indiana for twelve (12) years now. This year, our goal is to reach the $10,000 mark, which we are very close to fulfilling. The population of our town is only 10,000 and many people are repeat customers. But they love the wishing well and always toss their loose change in." Let your vendors pay for your Wells. Vendors always want to be front and center in stores. Everyone knows that sales success is about location, location, location. They will pay for that prime space in exchange for getting their brand and message on the Well such as "Provided by Your Vendor's Name". And this can be an annual payment which you can give to the charity, or toward your own bottom line. After all, it is your floor space and Wishing Well, so you can decide. You can give 100% of the coin revenue to your favorite charity, and more than cover your floor space costs from the sponsorship/advertising revenue. Click here to see many examples of sponsored Wells. A chain-wide program can raise millions of dollars. And it is the easiest form of fund-raising available because the Well does all the work. A large hospital chain in Malaysia, in cooperation with the International Rotary Club, are raising money to help treat needy citizens. Dairy Queen International has placed over 3,000 Wells in their stores to raise money for Children's Miracle Network. Hundreds of Walmart and Sam's stores raise money for Children's Miracle Network and other charities. McDonald's raises funds for Ronald McDonald House Charities (RMHC). The picture to the right shows a custom sign in the shape of a house with a chimney and smoke used by RMHC of Oregon. One of our campaigns raised over $10 million at K-Mart stores for a blind service organization in the Mid-West. A great question to consider is, "If the Wells were free, how many would you want? While we can't give them away, they can be essentially free because they pay for themselves so quickly, and/or you can get a vendor to pay for them...up front! If not a vendor, any one of many regional or local businesses would LOVE to get their brand in a retail floor space. This could be a cell phone company, auto dealer, soft drink distributor, insurance company, bank, or any company that doesn't have its own retail floor space, but advertises in your local media. 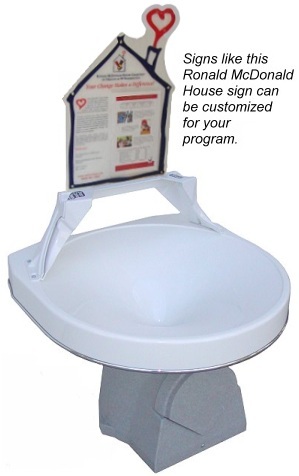 Simply stated, there is no better advertising available than a Wishing Well that generates smiles, fun, and benefits for charity. When you as the host get a Well, either buying it directly or getting it sponsored, you are doing a WONDERFUL thing for your preferred charity. They not only won't have to take money out of their limited budget to buy a Well, but you will be providing the floor space which is always the most important and the most challenging ingredient for Wells to do their job. 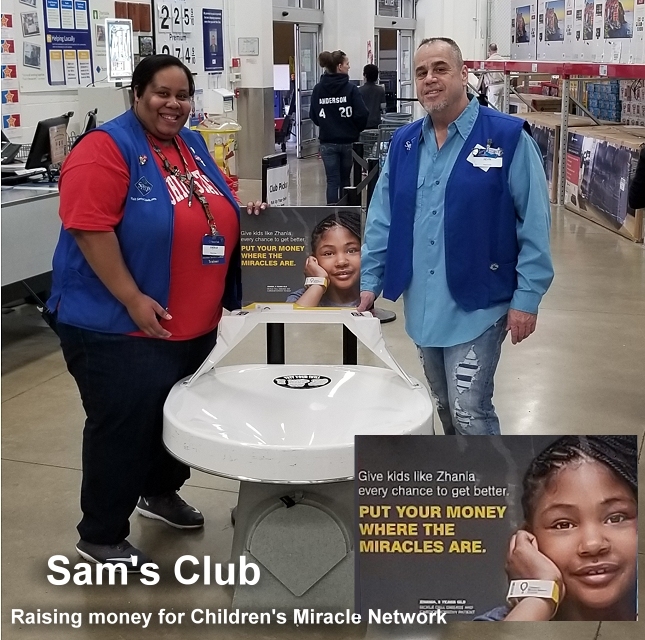 "The Wal-Mart Super Centers and Sam's Clubs have two wishing wells in all 11 locations , one well in each entry. They have been very effective fundraising tools for us over the years with no drop off. They are entertaining and an easy way for the stores to raise funds. They wouldn't want to be without them. They are clearly worth the one-time investment, and produce for years with no end in sight." Many charities and organizations would love to be able to rent or borrow a Well for a 1-day event. They are too expensive to ship for us to do that, but we would LOVE to refer inquiries from your area to you. We have a simple turn-key set of materials you can use to make your Well available to your community including a rim sticker that says, "If you would like to use this Well for your fund raising event, please ask," a template loan agreement that includes all the promotional things they can do to increase their income, a template press release letting the community know they can use your Well, and other items. 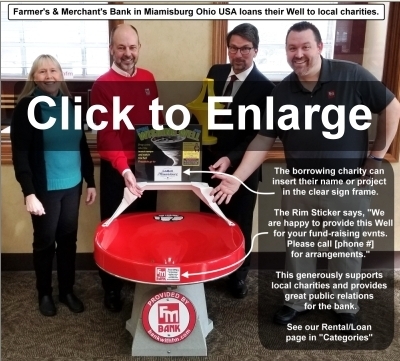 Click here or on the accompanying photo of a Well in a local bank. If you want LOAN your Well to local charities, click here. If you want to RENT your Well for a split of the revenue for your charity, click here. Your Spiral Wishing Well will be making people smile and laugh as they are mesmerized by the spinning coins. Something else is happening too. The Well is also being a great "demonstrator" and it is perfect time to offer them right on the sign with a message like, "Take the fun home with you! Get your own Mini-Well coin bank. As a store, you can sell them to your customers. They make a great impulse item. We include an offer like this on the generic sign that comes with every Well, with our phone number. But if you want to make the profit on the toys, we also can make a sales offer that instructs them to get their toy right there. We retail them on our website for $24.95. Your cost is either $15 if you have one floor model Well, or $12.50 if you have 2 or more Wells. By selling the Vortx toys, the floor space you are donating to your charity is making profit for you. You might as well because the floor model Well has already done the selling for you and made the offer! Everybody wins. Click here to read more about the toys. Most stores expect their Wells to raise $100 to $300 per month if they are just placed passively. If you feature them in a great location and encourage people to toss money in like the 7-11 store owner described above, the income can be a lot greater. If you have multiple stores or restaurants in your chain, the income can multiply significantly. K-Mark placed Wells in each of 300 of their stores for a campaign to raise money for the blind. They raised over $10 million. If a regional chain of 100 stores raised a modest $300 per month in each Well, that would be $30,000 per month or $360,000 per year. Many Wells generate much more than that, so you can see how easy it is to raise large amounts of money. And as the host, it provides many press release opportunities for you and your community support messages. Because the variables are many, we can't guarantee how much money the Wells will raise, but if they are in a foot traffic pattern, they will raise money without effort and it will be far more than any other passive income device. We will help you customize a program for your company, including custom colors, signs, and drop-shipping to each of your locations. Please contact us if you would like to discuss a regional or national program, either as a sponsor or a host. Doug Wead, Canyonville Christian Academy, Canyonville, Oregon: "The count is in, and we brought in $7,352.39 in one day! Isn't that fantastic! Of course, many people put in wads of bills and some pretty large checks. Thank you for letting us use a Well for our event." We would like to find a major company that would sponsor Wells for schools. Schools are one of the most eager customers, but most of them just don't have the funding to be able to purchase a Well. If the student demographic matches your needs, this is a wonderful opportunity to promote your brand and message and help schools at the same time. Schools raise money in their halls, cafeteria, sporting events, and all home and school events. Additionally, their math and science teachers use them as teaching aids using our Student Guide about planetary orbits, gravity, tornadoes, whirlpools, and the physics of the funnel. If your company wants to be connected to improving math and science, this is a great way to do it. If sponsoring Wells in schools doesn't fit your demographic, there are many other categories to choose from. Museums? Environmental projects? Animal Shelters? YMCA's? Salvation Army of Goodwill? Click here and let us know if you are interested in becoming a sponsor. We will help you set up a program that works for you and your charity, including signs screening qualifications. We can also take care of the distribution for you.